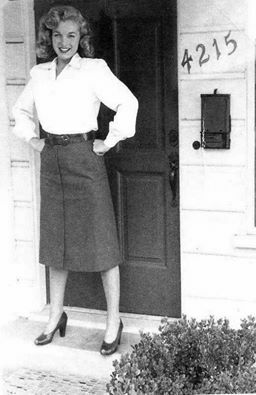 Norma Jeane Dougherty (Marilyn Monroe) in front of the home she lived in located at 4215 Rowland Avenue in Burbank, ca. 1947-1948. From Harry A. Marnell: "The former Rowland Avenue is now Warner Blvd, and the modest home at 4215 (built in 1937 per Assessor's Records) is still there, the fourth house west of Rose Street, about midway between Pass Ave and Clybourn Ave on the north side. Here's a Google Street View, though the front door is unfortunately in deep shade. Note: The Radioplane Company, in Burbank, was founded by British actor Reginald Denny in 1940. (Before that he owned a hobby shop business in Hollywood.) The company manufactured small remote-controlled pilotless aircraft, intended to help U.S. Army and Navy anti-aircraft gunners improve their targeting skills. During the war Radioplane produced nearly 15,000 target drones for the Army. The business was purchased by Northrop in 1952.